It's time to stop pretending that the same people fighting white supremacists are somehow exactly like them. There’s far too much to say about an event like Charlottesville. There’s the sorrow we all feel for the family of Heather Heyer, a young woman whose only crime was giving enough of a damn to risk her safety standing up to armed neo-Nazis. There’s the anger at an administration that has once again winkingly refused to condemn a white supremacist mob. There’s the frustration at the police, which is ever-ready to roll out tanks and dystopian armored warriors when it’s black people protesting against being murdered, but apparently stands on the sidelines whistling when armed racists rally in a public square. And there’s the fact that mainstream conservatives have been defending this exact type of violence for months. Gallons of ink will continue to be justifiably spilled on these and other topics in the weeks to come. And the battle to defeat the far right — through political organizing, mobilization, and the elimination of the social and political conditions that allow it to gestate and thrive — will be long and ongoing. 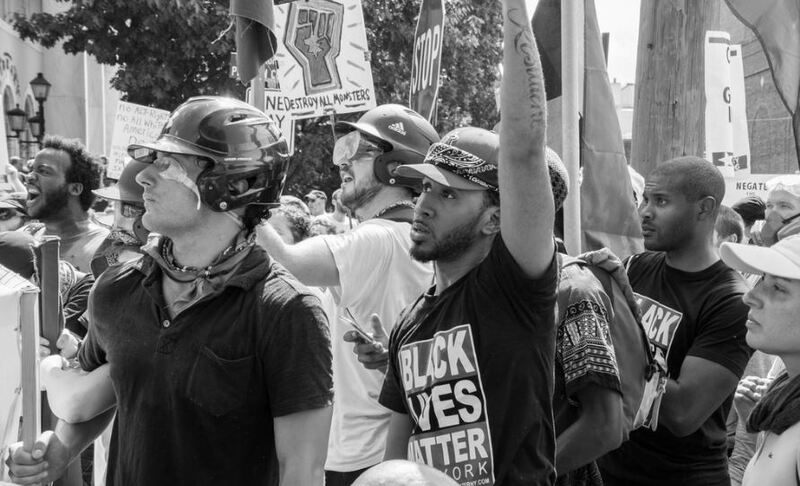 For months now, as part of the ongoing battle over the future of progressive politics in the United States, members of the liberal center have been warning about what they called the “alt-left,” the alt-right’s supposed mirror image. The term was first used in a Vanity Fair piece by James Walcott in March, in which he claimed there was a “kinship” between the two groups, and proceeded to rattle off a list of its supposed members, all of whom (bar Susan Sarandon) were men. It should go without saying that the label refers to something that doesn’t exist. This very publication, for instance, was cited by Walcott as one of the alt-left’s “outlets,” despite the fact that we routinely spend our time criticizing Trump and his cronies and are rooted in a longstanding democratic socialist tradition. The term was always intellectually lazy and dishonest, but veracity was never its point. Rather, it was an evolution of the “Bernie Bro” slur, a way to dismiss left-wing critiques of centrist Democrats by claiming those espousing them were racist, misogynistic, white men, even when they were people of color, women, or both. The insertion of the “alt” label was key — without needing to say a thing, the term drew up an affinity and connection between modern, rebranded white supremacists and those campaigning for universal health care and a higher minimum wage. In the months that ensued, the epithet and the idea that underwrote it were picked up and used by members of the liberal center as a cudgel against socialists, right up until the events in Charlottesville. “If the Bernie Bros wanted to make a show of force on behalf of progressive values, Saturday in Charlottesville would be a good time,” wrote Mieke Eoyang, former Ted Kennedy staffer and vice president of the National Security Program at Third Way, a centrist think tank. One popular liberal Twitter account compared the tiki torch-wielding mob of racists to Bernie Sanders supporters. Well, the neo-Nazi march in Charlottesville took place, and the same people who some have spent months dismissing as closet racists were on the front line, risking bodily harm to stand up against white supremacy. The International Socialist Organization (ISO) and Democratic Socialists of America (DSA) were part of the counter-protest, and their flags flew high after the alt-right marchers had gone. The DSA started a fundraiser to cover the injuries sustained by those attacked at the event, which has raised $138,000 as of the time of writing. Two of its members were injured in the attack on the protests. So were the family members of a staffer at Truthout, a publication that was critical of Clinton during the 2016 election, and one of whose journalists has featured on the “Trumpian Leftism” Tumblr as a “Bernie Bro” and alt-left member. Or let’s look at Heather Heyer, the murdered young woman who is so far the only casualty of Saturday’s right-wing attack. Heyer was a committed civil rights activist, whose mother, Susan Bro, said “always had a very strong sense of right and wrong.” She was also a Bernie Sanders supporter. This is hardly a new development. DSA and other left-wing organizations have been involved in anti-Trump protests, including those against the implementation of Trump’s travel ban. Socialists have been playing important roles in recent protests against police violence. If you go further back, you can find leftists organizing and defeating racists in places like Dubuque, Iowa during the nineties and in other campaigns for over a century. It is neither tenable or acceptable to smear leftists and progressives who oppose corporate Democrats as analogous to neo-Nazis. While those of us on the Left will continue to battle against the policies of the center — policies we think not only cause harm in the here and now but will do nothing to stem the rise of the Right — we should stand united with those liberals who want to stand with us against racism and hatred. There are some who are nonetheless clinging to a divisive and false narrative about the Left. The day after the incident, Daily Kos founder Markos Moulitsas wondered if anyone “outside of the alt-left” was “still pretending that “last year’s election was about economic anxiety.” A Daily Kos contributing editor blamed the neo-Nazi march on the “alt-Left,” who “in their drive to smear the ‘impurity’ of Clinton on economic justice issues, excused the racism and bigotry that is Trumpism,” which was “stinging very hard now.” Others made a similar point. This has to stop. Heyer and those who were injured at Charlottesville are neither the first nor the last left-wing activists who will be hurt at events like this, particularly as radicals are often on the front lines of such confrontations. They deserve better than this. The Left are neither supporters of white supremacy, nor supporters of Trump, and they never have been. But if liberals join the Left, they can help take the fight to the far right and end the seemingly neverending string of political violence committed by white supremacists. Uniting around this issue is a moral imperative.